Penny has set every possible failsafe so she can see the legendary "Nebula Sirens" without risking her life. What could go wrong? 92 backers pledged $2,370 to help bring this project to life. UPDATE: You will notice that we have reached our goal. However, this is our minimum funding goal to guarantee the comic can be produced, including a small on-demand print run, while exhausting my personal savings. If we can reach $4,422.50, then we can print a full professional print run, making this project an unqualified success. If we can reach $2,681, then I won't lose my shirt. 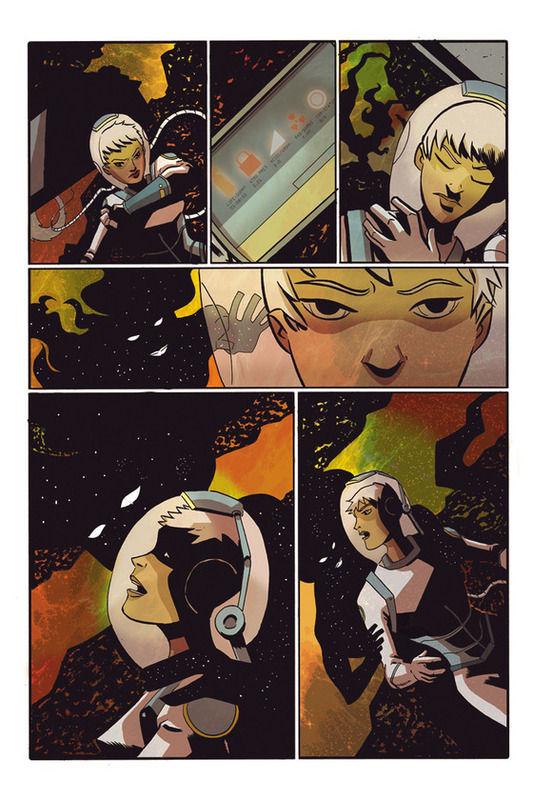 "Failsafe" is a one-shot comic story told in 22 pages. Written by Ian Struckhoff (The Deathlings, The Dark Age) and illustrated by Ryan Cody (Icarus, Popgun, Jesus Christ: In the Name of the Gun). It will be printed as a stand-alone issue, and as the feature story in an issue of the Black Label Comics anthology. We're raising funds to produce this comic, including paying the artist and printing the first run of copies. With your help, once it is done and copies are available, we can also submit to publishers. From the beginning, all books from Black Label Comics (writer Ian Struckhoff) have been funded thanks to Kickstarter, and we're proud and active members of the community here! - Tim R. - Our "Space Ghost" whose likeness and/or name will appear in the story! - Norah R. - Our "Spaceage Cheescake" whose likeness will appear in the story! Your name printed with our thanks inside the comic! Original inked FAILSAFE pages by Ryan Cody! 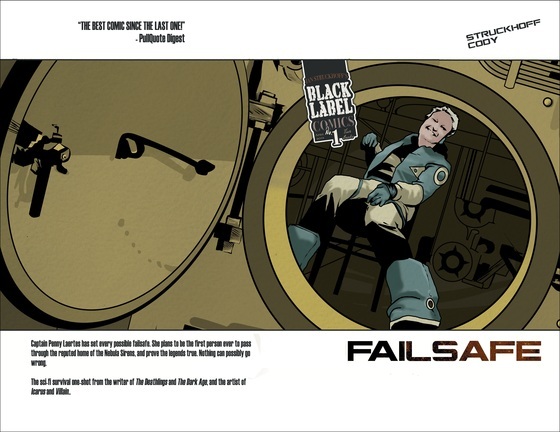 THE COMIC (US Shipping) - A signed copy of the very first printing of "Failsafe" (22 color pages) shipped within the United States. DIGITAL COMICS (PDF via Email) - Digital copies of "Failsafe" (22 color pages plus bonus materials) and three of our other comics. For people outside of the USA looking for a less pricy option, or those who prefer a digital version. THE COMIC (International Shipping) - A signed copy of the very first printing of "Failsafe" (22 color pages) shipped anywhere. THANKS IN THE BOOK & FIVE COMICS - Your name will be printed with Thanks in "Failsafe", as a supporter. Plus you'll receive your own signed copies of Failsafe, and the first four comics released by Black Label Comics. ORIGINAL SKETCH BY RYAN CODY - Your own original sketch of a character from "Failsafe" by the artist Ryan Cody, plus a signed copy of the comic. SPACE GHOST - One lucky person will have their likeness and/or name appear in the story somewhere-- It could be you! Plus you'll receive a copy of the comic signed to you personally. ORIGINAL PAGE - Your own one of a kind, original inked (black and white) page from FAILSAFE signed by the artist, plus your copy of the FAILSAFE comic and THREE of our other comics. SPACEAGE CHEESECAKE - We're adding a special reward, but this one is only available for the ladies! One lucky person (or someone they gift the reward to) will have her likeness and/or name appear in the story as a space-age pin-up girl. It could be you! 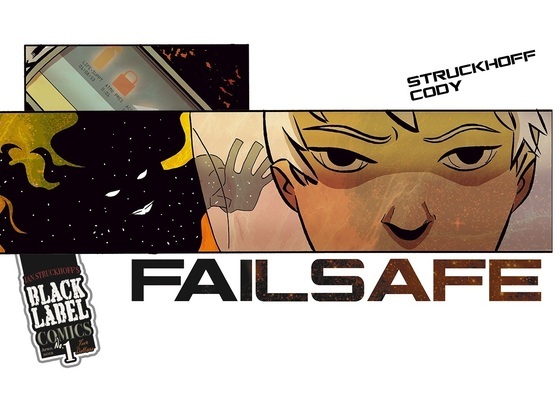 Plus you'll receive a copy of FAILSAFE signed to you personally, and three of our other comics. ORIGINAL ART BONANZA - You will get first choice of one original inked page from FAILSAFE, as well as a sketch commission, both created and signed by artist Ryan Cody. On top of that, you'll get a signed copy of each of our comics-- "Failsafe", the "Failsafe" variant, "The Deathlings" #1, "The Dark Age" #1, and the rare variant edition of "Black Label Comics" #1. Plus your choice of three Black Label Comics posters or a t-shirt, and of course your name printed with Thanks in the book. SPONSOR - For making a major pledge, your name will be printed in the comic with Special Thanks as a sponsor and major supporter, and we'll track down a UNIQUE mystery reward only for you. On top of that, you'll get multiple signed copies of a bunch of our comics-- "Failsafe", the "Failsafe" variant, "The Deathlings" #1, "The Dark Age" #1, and the rare variant edition of "Black Label Comics" #1. PUBLISHER - NOW REDUCED! For saving the day at the last minute, be listed in the book as the official publisher, with Very Special Thanks. We'll also include everyitng from the "Rescue" reward, plus a t-shirt, a poster pack, and another dozen signed copies of the comic.